Department of Internal Medicine, University of Dammam And King Fahd University Hospital, Al Khobar, Saudi Arabia. Al Elq AH. Symptomatic Hypocalcemia Associated with Zoledronic Acid Treatment for Osteoporosis: A Case Report. Oman Med J 2013 Mar; 28(2). Intravenous bisphosphonates are widely used in the management of solid tumors, metastatic bone disease, metabolic bone diseases and hypercalcemia of malignancies. Recently, yearly intravenous injections of zoledronic acid, one of the potent nitrogen-containing bisphosphonates, have also been approved for the prevention and treatment of osteoporosis. Although infrequently observed, asymptomatic hypocalcemia mainly due to intravenous bisphosphonates has been documented. Here we report a female patient who exhibited profound symptomatic hypocalcemia after receiving intravenous zoledronic acid as treatment of postmenopausal osteoporosis. The patient was not assessed for calcium status prior to the intravenous bisphosphonate therapy, and she was later found to have severe vitamin D deficiency. To our knowledge, this is the first patient with symptomatic hypocalcemia to be reported after zoledronic acid was approved for the management of osteoporosis. We highlight the importance of evaluating calcium and vitamin D levels before initiating intravenous bisphosphonate treatment, particularly in the presence of widespread vitamin D deficiency and the likelihood of future increases in the prescription of intravenous bisphosphonates. Keywords: Bisphosphonates; Zoledronic acid; Adverse effects; Hypocalcemia. Bisphosphonates induced hypocalcemia can also be profound and prolonged, and serum calcium normalization may take upto two months.10 Here we report a female patient who exhibited profound symptomatic hypocalcemia after receiving intravenous zoledronic acid as a treatment for postmenopausal osteoporosis. We call attention to the possible increase in the number of cases of symptomatic hypocalcemia due to post-intravenous bisphosphonate therapy, particularly after the approval of zoledronic acid for management of one of the most common diseases. Also, we stress the importance of evaluating calcium and vitamin D levels before initiating intravenous bisphosphonate treatment in light of the high prevalence of vitamin D deficiency worldwide, and especially among patients with low bone mass. A 55-year-old female had a history of primary hypothyroidism, dyslipidemia and gastritis. She was also reported to have irritable bowel syndrome for many years based on history of recurrent non-bloody diarrhea. Menopause had occurred at the age of 45. She was seen at the gynecology clinic in 2010 for evaluation of lower abdominal pain and vulval itching. Because of her history of early menopausal, the gynecologist started her on oral calcium carbonate 600 mg twice a day and 1alpha-hydroxyvitamin D3 (1alpha-OHD3) 0.25 µg once daily. Evaluation of bone mineral density (BMD) was requested at the same visit and the result of the test was consistent with osteoporosis of the spine and osteopenia of the hip region (lumbar spine BMD 0.0.698 g/cm2, T score - 3.2; total hip BMD 0.796 g/cm2, T score -1.2). Three months from the initial visit and after the BMD report, she was given a single intravenous infusion of zoledronic acid (Aclasta®) 5 mg in 100 cc normal saline over 15 minutes. Unfortunately, calcium studies were not requested prior to the infusion. She came to the emergency room one day post-infusion after experiencing a few hours of nausea, vomiting and diarrhea. She was treated symptomatically as a case of gastroenteritis and discharged from the emergency room. Two days later, she returned with generalized body ache, numbness in the area around the mouth and hands, palpitation, shortness of breath, nausea and vomiting but no diarrhea. Physical examination was negative for Chvostek's and Trousseau's signs. Her BP was 160/85 and her pulse was 110/min (regular). At this stage, serum calcium was requested and her corrected calcium level was 7.1 mg/dl (1.76 m mol/l; the normal range = 8.5-10.5 mg/dl). Other laboratory data were collected at the same time and revealed the following: phosphorus was 1.2 mg/dl (normal range = 2.5-4.9), Mg was 2.3 mg/dl (normal range = 1.8-2.4), and alkaline phosphatase was 115 U/L (normal range = 50-140). The renal function test was normal with a BUN level of 9 mg/dl (normal range = 7-22) and creatinine of 0.5 mg/dl (normal range = 0.5-1.0). The electrocardiogram showed only sinus tachycardia. 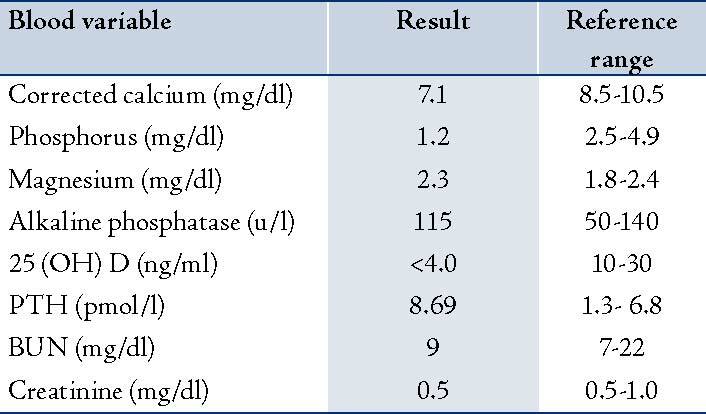 Serum 25-hydroxyvitamin D later showed severe vitamin D deficiency (<4.0 ng/ml, <10 n mol/l; normal range = 10-30 ng/ml) and PTH level was 8.69 pmol/l (normal range = 1.3- 6.8), (Table 1). The patient was acutely managed with intravenous calcium gluconate. Therapeutic doses of oral calcium and vitamin D therapy were also initiated. After 17 days, the corrected calcium level increased and stabilized within the normal range. The patient was reluctant to receive bisphosphonate therapy again; however, repeated BMD after 18 months from the initial dose of zoledronic acid and oral calcium with vitamin D supplement showed a BMD of 0.762 g/cm2, T score -2.6 at the lumbar spine and BMD 0.866 g/cm2, T score -0.7 at total hip. Our patient developed symptomatic hypocalcemia three days after the intravenous zoledronic acid therapy, which she received as treatment for osteoporosis. She had no prior assessment of calcium status, and her calcium level was measured only after she became symptomatic. She was later found to have severe vitamin D deficiency with secondary hyperparathyroidism. Vitamin D deficiency is common worldwide and is very common among Saudi women with a prevalence reaching 80%.21-23 Low vitamin D is also prevalent among patients with low bone mass; vitamin D deficiency was recently found to be present in almost two-thirds of patients with osteoporotic hip fracture in Spain.24 On the other hand, zoledronic acid is one of the most potent bisphosphonates which can put patients at increased risk of developing hypocalcemia. Zoledronic acid has recently been approved for the prevention and treatment of osteoporosis. In the initial published trial of zoledronic acid as a treatment for osteoporosis, only 0.3% of patients developed hypocalcemia. This low prevalence was attributed to the fact that all of the study patients were on supplemental calcium and vitamin D.25 In spite of being on calcium and vitamin D supplements for almost 3 months, our patient developed symptomatic hypocalcemia shortly after receiving intravenous zoledronic acid, most likely because of the missed severe vitamin D deficiency. To our knowledge, this is the first case of symptomatic hypocalcemia to be reported after Zoledronic acid (Aclasta®) was approved for the management of osteoporosis. The median time of occurrence of hypocalcemia post-zoledronic acid infusion was documented to be 6 days.18 The most likely explanation of the early symptomatic presentation in our patient (within 3 days) is the concomitant vomiting and diarrhea, in addition to the long-standing, severe vitamin D deficiency as indicated by the elevated PTH levels. Similarly, Peter et al.16 reported four cases of severe hypocalcemia after intravenous bisphosphonates; one of them had very low vitamin D levels (<4.0 ng/ml) and exhibited hypocalcemia within 3 days of receiving intravenous zoledronic acid as part of a treatment for transitional carcinoma of the bladder. Our patient also exhibited very low levels of serum phosphorus, possibly related to secondary hyperparathyroidism. Pre-existing hypocalcemia and renal impairment are contraindications to zoledronic acid therapy. It is recommended that all patients have their calcium levels and vitamin D levels assessed, and (if found to be deficient) to have them corrected before initiating the treatment with zoledronic acid. It is also recommended that sufficient vitamin D supplementation be given before and after zoledronic acid infusion in order to ensure and maintain adequate vitamin D levels.3 In spite of the above recommendations, and in spite of the several cases reported in the literature of symptomatic hypocalcemia due to post-intravenous bisphosphonate therapy where vitamin D deficiency was the main risk factor, the patient in this report unfortunately received zoledronic acid infusion before evaluation of her calcium and vitamin D status. It is expected that the number of clinically significant hypocalcemia cases due to post-intravenous bisphosphonate therapy will increase, particularly after zoledronic acid, a potent and long-acting bisphosphonate, is approved for the prevention and treatment of osteoporosis. This will be more evident among communities where vitamin D deficiency is common and the number of patients susceptible to developing symptomatic hypocalcemia is large. This report highlights the importance of diagnosing and treating hypocalcemia and concomitant vitamin D deficiency before initiating zoledronic acid therapy for the prevention or treatment of osteoporosis. Clinicians need to be more alert about hypocalcemia as a potential complication that can sometimes be prolonged, deleterious and even life-threatening. They also need to adhere strictly to the recommendations regarding prior assessment and management of calcium and vitamin D.
The author is grateful to all medical staff who contributed to the management of the patient. No conflict of interest to declare. 1. Theriault RL, Hortobagyi GN. The evolving role of bisphosphonates. Semin Oncol 2001 Jun;28(3):284-290. 2. Russell RG. Bisphosphonates: the first 40 years. Bone 2011 Jul;49(1):2-19. 3. Räkel A, Boucher A, Ste-Marie LG. Role of zoledronic acid in the prevention and treatment of osteoporosis. Clin Interv Aging 2011;6:89-99. 4. Tanvetyanon T, Stiff PJ. Management of the adverse effects associated with intravenous bisphosphonates. Ann Oncol 2006 Jun;17(6):897-907. 5. Panteliou E, Young N, Naysmith M. Life-threatening hyperkalemia following zoledronic acid infusion for Paget’s disease: a case report. J Med Case Rep 2011;5:367. 6. Coxon FP, Helfrich MH, Van’t Hof R, Sebti S, Ralston SH, Hamilton A, et al. Protein geranylgeranylation is required for osteoclast formation, function, and survival: inhibition by bisphosphonates and GGTI-298. J Bone Miner Res 2000 Aug;15(8):1467-1476. 7. Ho JW, Sundar S. Prolonged hypocalcemia after zoledronic acid in a patient with metastatic prostate carcinoma: did zoledronic acid trigger osteoblastic activity and avid calcium uptake? Clin Genitourin Cancer 2012 Mar;10(1):50-53. 8. Chesnut CH 3rd, Harris ST. Short-term effect of alendronate on bone mass and bone remodeling in postmenopausal women. Osteoporos Int 3 Suppl 1993; 3:S17-19. 9. Papapetrou PD. Bisphosphonate-associated adverse events. Hormones (Athens) 2009 Apr-Jun;8(2):96-110. 10. Gulley JL, Wu S, Arlen PM, Dahut WL. Persistent hypocalcemia induced by zoledronic acid in a patient with androgen-independent prostate cancer and extensive bone metastases. Clin Genitourin Cancer 2007 Sep;5(6):403-405. 11. Dogru T, Sonmez A, Tasci I, Genc H. Symptomatic hypocalcemia due to oral risedronate therapy. Indian J Med Sci 2005 Dec;59(12):542-543. 12. Whitson HE, Lobaugh B, Lyles KW. Severe hypocalcemia following bisphosphonate treatment in a patient with Paget’s disease of bone. Bone 2006 Oct;39(4):954-958. 13. Kohno N, Aogi K, Minami H, Nakamura S, Asaga T, Iino Y, et al. Zoledronic acid significantly reduces skeletal complications compared with placebo in Japanese women with bone metastases from breast cancer: a randomized, placebo-controlled trial. J Clin Oncol 2005 May;23(15):3314-3321. 14. Zuradelli M, Masci G, Biancofiore G, Gullo G, Scorsetti M, Navarria P, et al. High incidence of hypocalcemia and serum creatinine increase in patients with bone metastases treated with zoledronic acid. Oncologist 2009 May;14(5):548-556. 15. Rosen CJ, Brown S. Severe hypocalcemia after intravenous bisphosphonate therapy in occult vitamin D deficiency. N Engl J Med 2003 Apr;348(15):1503-1504. 16. Peter R, Mishra V, Fraser WD. Severe hypocalcaemia after being given intravenous bisphosphonate. BMJ 2004 Feb;328(7435):335-336. 17. Breen TL, Shane E. Prolonged hypocalcemia after treatment with zoledronic acid in a patient with prostate cancer and vitamin D deficiency. J Clin Oncol 2004 Apr;22(8):1531-1532. 18. Maalouf NM, Heller HJ, Odvina CV, Kim PJ, Sakhaee K. Bisphosphonate-induced hypocalcemia: report of 3 cases and review of literature. Endocr Pract 2006 Jan-Feb;12(1):48-53. 19. Mishra A. Symptomatic hypocalcemia following intravenous administration of zoledronic acid in a breast cancer patient. J Postgrad Med 2008 Jul-Sep;54(3):237. 20. Chennuru S, Koduri J, Baumann MA. Risk factors for symptomatic hypocalcaemia complicating treatment with zoledronic acid. Intern Med J 2008 Aug;38(8):635-637. 21. van Schoor NM, Lips P. Worldwide vitamin D status. Best Pract Res Clin Endocrinol Metab 2011 Aug;25(4):671-680. 22. Al-Turki HA, Sadat-Ali M, Al-Elq AH, Al-Mulhim FA, Al-Ali AK. 25-Hydoxyvitamin D levels among healthy Saudi Arabian women. Saudi Med J 2008 Dec;29(12):1765-1768. 23. Ardawi MS, Qari MH, Rouzi AA, Maimani AA, Raddadi RM. Vitamin D status in relation to obesity, bone mineral density, bone turnover markers and vitamin D receptor genotypes in healthy Saudi pre- and postmenopausal women. Osteoporos Int 2011 Feb;22(2):463-475. 24. Larrosa M, Gomez A, Casado E, Moreno M, Vázquez I, Orellana C, et al. Hypovitaminosis D as a risk factor of hip fracture severity. Osteoporos Int 2011. Epub ahead of print. 25. Lyles KW, Colón-Emeric CS, Magaziner JS, Adachi JD, Pieper CF, Mautalen C, et al; HORIZON Recurrent Fracture Trial. Zoledronic acid and clinical fractures and mortality after hip fracture. N Engl J Med 2007 Nov;357(18):1799-1809.